Another Boston Final Cut Pro User Group meeting is in the books, and as usual, it was an enjoyable evening. This month's meeting took place at the University of Massachusetts Club in Boston's financial district. I think Daniel Berube had to schedule this month's meeting a week early since he'll be in the U.K. next week for the London SuperMeet. Unfortunately, there wasn't any news about a Final Cut Pro X release, since there wasn't an announcement made at Apple's June 6th WWDC. This month's meeting featured Ken LaRue discussing Autodesk Smoke for Mac 2012, the always entertaining Bob Russo talking about Avid's Media Composer 5.5, , and Jay Ignaszewski talking about AJA's tapeless workflow solutions. As usual, the evening concluded with the Big Dig Raffle, which featured an AJA KiPro Mini. I was especially interested in Bob's Media Composer presentation, since I use Premiere and Final Cut, and haven't had much exposure to Media Composer. I was also looking forward to hearing from Jay, since I enjoy keeping up with tapeless workflow solutions. At first glance, the Smoke GUI is very cluttered and utilitarian. Ken stressed that as you use the program, you start to get more comfortable with the layout. Looking at it for the first time, you just see a screen cluttered with many buttons in no apparent logical order. Ken was using what looked to be a Wacom tablet and pen to navigate. Smoke offers very impressive tracking tools. Ken showed us some tracking demos, and Smoke handled multiple tracking points very quickly. There's lots of rendering to be done after you apply all of Smoke's various tools. Ken rendered everything, rather than show it in real time unrendered playback. He was using a nice Mac Pro with a powerful Nvidia graphics card (I forget what model he mentioned), so the renders were pretty fast. Obviously, Smoke integrates well with other Autodesk programs like 3D Studio Max and Maya. Ken was importing 3D objects created in 3D Studio Max and had the ability to manipulate them in Smoke. Smoke has node based aspects to it as you start to apply the available tools, so that node window can get very cluttered and hard to read. Ken flew around the node window very quickly, so I'm sure it's something that comes with using the program. The retail price for Smoke is $15,000, so their target market isn't the low end video production pro. Their demo video featured many high end post production houses using Smoke for feature films and national commercials. MC 5.5 now supports the AJA IO Express to capture footage. To end a debate I had with a couple coworkers over a few beers one night, Bob pronounced it "A.J.A." (the letters), not "Ahh-Jaa" (phonetically). Bob started with a demo of combining multiple formats and varying frame rates on the same timeline. Bob continued on to show us a multicam edit. The process and interface looked very similar to multicam edits in Final Cut and Premiere. ScriptSync is Avid's tool for linking your media to a text file containing your script. Bob had footage shot for a very cheesy small budget film, along with the script. ScriptSync was able to process the text in the script and sync it with the same text spoken in the footage. Bob's next demo showed us how to manipulate clips in the timeline using the tools we're familiar with in FCP and Premiere: ripple, roll, etc. Bob also showed us that it's easy to simply click on a transition in the timeline to adjust duration. Bob threw in a little sales pitch for some control surfaces that will integrate well with MC 5.5. Avid purchased Euphonix a year ago, so those were the control surfaces featured. PhraseFind is a feature in MC 5.5 that will scan the audio in your media and catalog it to make a searchable database. It phonetically catalogs the dialogue, so Bob mentioned that you also need to think and type phonetically when you're searching. I imagine it has the same issues as text to speech conversion, but just in reverse. Talking about the Ki Pro, Jay said "right now it's just ProRes". Does that mean that AJA is working on offering multiple codecs, like the Cinedeck Extreme that can record to ProRes, Avid's DNxHD and Cineform? Or it means nothing and I'm digging too much into his comment. Only a few compact flash card manufacturers are approved by AJA for use in the Ki Pro Mini. Obviously they've had issues with cheap cards not being able to keep up with the bandwidth required to capture ProRes 422 HQ (which is 220 Mbps). It's easiest to connect the Ki Pro Mini to a laptop via ethernet and make settings adjustments with the software interface. The screen on the unit looks pretty small. Big Dig Raffle prize winner! I was thinking of asking the winner of the Ki Pro Mini to trade with me, but he left before I could hunt him down. Next month's Boston Final Cut Pro User Group meeting will focus on the newly released (hopefully on Tuesday) FCP X and will feature Steve Martin (the FCP trainer, not the comedian). Steve is a great trainer and I look forward to seeing him. My coworker, Kevin McGowan, took a couple Post Production World classes taught by Steve this year at NAB and really enjoyed them. I'm a big fan of the BOSFCPUG, so if you live in the Boston area, keep an eye on their website for news about the July meeting. I hope to see you there! I recently decided to move my four 1TB drive RAID5 setup out of my computer case and into an external enclosure. I use this RAID to store all the media for the current project I'm working on, while OS and programs are stored on a separate hard drive. I previously had the 4x1TB RAID5 in my computer case connected to my Gigabyte GA-X58A-UD3R motherboard's Intel ICH10R SATA controller, which has 3.0Gbps SATA connectors. I know that everyone recommends an external RAID controller for best performance, but cost was a factor. I was getting decent enough read and write speeds for the work I was doing, and I never had a problem with the controller dropping the RAID configuration, so I stuck with the motherboard's controller. I typically work with AVCHD 1080i60 (recorded by my Canon HF20 at 24mbps) and DVCPRO 720p60 footage (recorded on P2 media at 100mbps), and I was getting enough transfer speed to comfortably edit multicam timelines. I now have a need to add another free standing hard drive to my system, so to free up room inside my case, I decided to get the four RAIDed drives out of there and into an external case. It was really tight with all those drives in my computer's case. This will also reduce case temps, increase airflow inside the case, and reduce power draw. Again, cost was a major consideration, so I had to focus on the cheaper external RAID enclosure options. I landed on Mediasonic's ProRAID HFR2-SU3S2, which was on sale for $129 at Newegg. My first impression of the ProRAID is that it has a very solid feel to it. 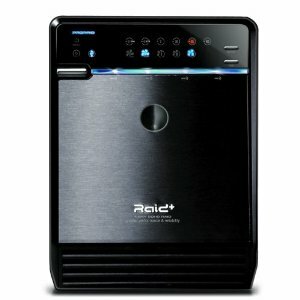 The unit holds four hard drives and has a built in RAID controller supporting 0/1/3/5/10 RAID levels. RAID levels are changed with a front panel button. The case is made of aluminum and the power connector is on the side of the unit, rather than the back, which is awkward. This unit has a built in, very quiet fan which you can set to three different speeds, or just leave it on an "auto" setting. The unit will also power up and down automatically as you start and shutdown your computer. I had a very hard time configuring the ProRAID. Upon first power up I got an error LED on front panel and the RAID would not be recognized by Windows 7 Disk Management tool. I followed the manual's description of how to set it up using a RAID5 configuration, but the error LED remained on. I tried connecting it via eSATA and USB 3.0, but kept getting the same error LED. I tried a RAID0 configuration, and that worked, so there was hope that this thing wasn't a brick right out of the box. I switched back to RAID5 and the error LED was back, so I pulled out the drives, reseated them and mixed up their order in the case. Tried restarting and still got the error message. Randomly, after another restart, it was recognized by Windows and I never saw the error LED pop on again. Now I was seeing a new issue: Windows Disk Management was showing an incorrect drive size. It was telling me that four 1TB drives in a RAID5 configuration was only 784GB. Obviously very wrong. The Intel software that shows the status of the Intel SATA controller on the motherboard was showing the correct usable size for a 4x1TB RAID5 config: 2.8TB. Windows Disk Management wouldn't allow me to format the RAID to any size larger than 784GB. I tried a full restart of my computer, and now the MediaSonic ProRAID was only recognizing three of the four hard drives in the RAID, but now it was showing a total size of 1.8TB, which is correct for a 3x1TB drive RAID5 config. Getting closer, but still not there. I did another pull of all the drives and reseated them. Now I tried connecting the ProRAID to another SATA controller on my motherboard (the JMicron JMB362 chip), since I had been connecting via eSATA to my motherboard's Intel ICH10R SATA controller up to this point. Connected to the JMicron eSATA chip, all of a sudden the ProRAID is finally recognizing all four hard drives and Disk Management is showing the correct size of 2.8TB. I initialized and formatted the RAID drives with ease. If you're reading this because you've purchased this device, make sure you use a partition style of GPT (GUID Partition Table) and a file system of NTFS. Also make sure to right click on the RAID in Device Manager, click on "properties", choose the "policies" tab and check the box next to "enable write caching on the device", otherwise you'll have abysmal write times. Not sure why this isn't checked by default when you format the drive, but it wasn't for me. I powered down the ProRAID, connected again to the eSATA port connected to the Intel SATA controller, and all is well. Now that I got this sucker finally up and running, it's time to do some read and write speed tests. I used ATTO Disk Benchmark v.2.47. I'll post the ATTO tests results here for you to check out. All of these tests were done on completely empty, 7200 RPM drives. The image above is my control, showing write and read speed test results when I still had my 4x1TB RAID5 housed inside my computer case and it was being controlled by my motherboard's Intel ICH10R SATA controller. The numbers on the left represent different size files (in KB) that ATTO transfers to measure write and read times. As you can see, pretty nice read times for a motherboard's SATA controller. The image above shows the speed test results for the ProRAID connected to my comp via eSATA. The same four 1TB drives that were in my computer were moved to the ProRAID. I'm even connecting the ProRAID to my comp via an eSATA port that is connected to and controlled by the Intel ICH10R SATA controller on my motherboard. That's the same SATA controller that these four drives were connected to when they resided inside my computer case. The only difference here is that the RAID5 is being controlled by the Mediasonic's ProRAID internal RAID controller, rather than the Intel ICH10R's RAID controller. As you can see, much better write times with the ProRAID (which I read is a limitation on the Intel ICH10R chip), but the read times suffer and seem to cap out at 250MBps. When editing video, read times are very important, so I'm disappointed to see those drop. Still plenty of speed for the kind of video I edit, but more is always better. The image above is a speed test connecting the ProRAID to my computer via a USB 3.0 connection. Both the ProRAID and my motherboard support USB 3.0, so I decided to give it a try. As you can see, I get slower write and read speeds than when I had the ProRAID connected via eSATA. USB 3.0 is supposed to have faster speeds than eSATA (5.0Gbps vs 3.0Gbps) but as you can see from my speed tests, I get better transfer speeds with the ProRAID using an eSATA connection. Theoretically I should be getting the same transfer speeds using eSATA and USB 3.0, since I'm not bumping up against the max bandwidth for either interface, so the only explanation here is that my Intel ICH10R SATA controller is simply more effecient than my motherboard's USB 3.0 controller. Gigabyte describes my motherboard's USB 3.0 chip as a "NEC chip", so I'm not sure what the specific model number is. I will also say that I haven't fished around for any new driver updates for the USB 3.0 chip, so that might improve speeds slightly. The image above is a speed test using the ProRAID connected to my computer via eSATA to another SATA controller on my motherboard: the JMicron JMB362 SATA controller. I knew that this SATA controller isn't as fast as the Intel ICH10R controller, and this image shows that. So as you can guess, my conclusion is that I will use the ProRAID connected via eSATA to a port connected to the Intel ICH10R controller. I haven't had hours and hours of testing the ProRAID under real world editing conditions, but I can tell you that it I haven't run into any speed issues so far. It had no problem playing back three DVCPRO HD 720p60 streams for a multicam edit. I really hate that I ran into these random issues getting the ProRAID initialized. I'm no A+ certified IT technician, but I do consider myself to be pretty tech and computer savvy. I could see most general users giving up if they had the same troubles I had getting the ProRAID up and running. Being a technician, I can't just accept it when a piece of electronics behaves randomly. I get nervous that it will decide to randomly crap out in the future on me, and of course, at the worst possible time. So far it's been pretty solid, but I'll keep you updated if I run into any problems with the Mediasonic ProRAID. On Wednesday, May 25th, the Boston Final Cut Pro Users Group held an event at Rule Camera. After great talks by Philip Hodgetts and Yan Shvalb, three short films created using DSLR cameras were screened. One of those films was produced and directed by Boston based filmmaker, Paul Antico. Paul screened a trailer for his upcoming documentary called The Visualmakers. I was very impressed with the trailer and I can't wait to see the finished film. I was so impressed that I asked Paul to take some time to do a little Q&A with me, and he was kind enough to agree. Mike: "What inspired you to decide to produce this film?" Paul: "As affordable digital cinema tools (mostly up until recently, HDSLRs) have come into use by independent creatives, I found that so many people online were concentrating on the gear, the ways to get jobs, the networking, and so on without pausing to think about why they do what they do. I think that filmmaking (and really creativity in general) is an emotional endeavor in some ways - it an be technical but if you don't focus in on the emotion behind the story you are missing the point. The Visualmakers seeks to explore the motivation behind these filmmakers, offer some advice for people just starting, and shine a light on the process as an art and craft. Making independent film is not just checking boxes on a gear list. As for the title "The Visualmakers" - it comes from a term I coined called Digital Visualmaking. The idea there was let's not call it HDSLR video making, or filmmaking, or even necessarily be limited to motion pictures at all. We are all making visuals using digital tools - photography, videography, cinema motion pictures, explorations of light, color, illustration and so on. We are all united in that we make visuals - hence the title (even if this particular doc focuses on "filmmaking".)" Mike: "When did you start planning this production?" Paul: "The doc kind of came together on a whim a month prior to NAB. I had planned to film at the show some interviews with various "names" in our little twitter-connected indie filmmaker group to put on my site needcreative.net. My site focuses on the creative process and technique, not just gear and I wanted to augment that. The Associate Producer on Visualmakers - Kira Macalpine - then asked me if I wanted to do more. Organically we discussed some ideas and the interviews turned into a documentary." Mike: "Let's get the gear question out of the way: what cameras, lenses and audio accessories did you use, and what programs are you using for post production?" Timelapses modified using Adobe Lightroom and CHV Electronics Long Exposure Plugin"
Mike: "Are there any filmmakers that you wanted to include, but just couldn't schedule a time to interview them?" Paul: "Yes. I wanted to get Nino Lietner and Den Lennie but I had to cap the production at 10 people for logistical reasons. Khalid Mothasseb and Jon Bregel of Next Level Pictures were scheduled to be in it as well but at the last minute, literally, got pulled into a production in Vegas and couldn't attend. If I had to do it all over, I would have perhaps tried for some bigger names as well such as perhaps Gale Tattersall and Bob Primes and so on but in the first round I wanted to limit it to people we have heard of that were within our level of experience, although within a wide spectrum." Mike: "What have been your biggest production and post production challenges?" Paul: "Time. Or lack of it. Trying to find time to be at NABShow, network, see the show, and so on and get people to sit down for a proper interview was nearly impossible. I chose NAB because I knew everyone would be in the same place, but it was a nightmare trying to get everyone together. If it wasn't for their professionalism, this would never have happened. Trying to find places to film was also a challenge. Everything was necessarily rushed and I wouldn't do it that way again. This lack of time and rushing to get everything done also presents post production challenges, such as having to deal with difficult lighting and sound situations. And I am editing this alongside doing my own freelance work and a full time job for DHS, so it's exceedingly difficult to complete the piece staying true to my own vision and do it within a reasonable timeframe. Sound has also been a challenge... see next question." Mike: "Was it difficult capturing clean audio on the noisy NAB show floor?" Paul: "Surprisingly, the best audio actually came from the show floor. No one expected this. We used the Sony UWP-V1 wireless mics which worked very well, but the key was mic placement. The mic is just out of frame right below the subject's mouth, which helped a lot. We also tried to find a spot on the floor that had a predictable din - a constant level of noise. I applied some significant noise reduction but of course you can't get it all out. However people see that the subjects are being interviewed at a show so it all works well in the end. The difficulty was the noise in the quiet hotel room. We had some significant interference that raised the noise floor. I have no idea where it was coming from. In the future in both cases I'll use a wired lav first and wireless as a backup." Mike: "Were you able to enjoy the NAB show, or were you busy filming the whole time?" Paul: "2 out of the 4 days were spent filming, and lots of work in between wrangling people. Afterwards was tough too, getting releases and sample footage and so forth. So as a result I didn't get to enjoy the show nearly as much as I wanted to, either during or afterwards networking-wise. I did go to many networking events and parties, and got to meet with people that way, but I missed a bunch of vendors I had wanted to meet with due to filming. If I had to do it again, I would have scheduled all the filming for one day, and in a proper location. Or I wouldn't do it at all, at least not at NABShow." Mike: "When is your expected release date for the film?" Paul: "July. As in the end of July. It will be about 30 minutes, though I have a ton more footage that I may release online as "extras". Soon a website will be up for the film: www.thevisualmakers.com"
Mike: "Who else has been very involved in helping you produce this film?" Special Thanks to Kira Macalpine, Jared Abrams, D-FOCUS, Sid Levin, Steve Weiss, and Rick Macomber"
Paul: "Not at this time, however I have had a number of requests to talk about the film (for example, I will be showing a bit more of it in June at DV Expo east in NYC). And I've screened it at Boston's Final Cut Pro User's Group meetup and will do so at other similar venues. We may show on more than just Vimeo when released, but the primary purpose is to give back to the community online and perhaps encourage others to go out and start creating!"